Dell'Orto VHSB 37 ED (the carburetor more 'largest ever mounted on a road 125) to replace the 28 mounted on the other arrows. In that regard, and 'useful to recall that in 1990 the Regulation SP did not yet provide any limitation on the size of carburetors; limitations that were later introduced for the 1992 season, reducing the maximum size of 28mm speaker. Apart from a more sporting suspension calibration, the cycling knows no special modifications compared to C12R "base." C12R compared to normal, the competition has a more aggressive engine and thanks to carburatorone 37mm and the improvements to the cylinder is more 'inclined to turn to schemes and longer in the red zone. The performances were a reported top speed of 169.4 (163km / h C12R) and evidence of recovery in the 400 meters to 50km / h time of 20.9 at an output rate of 88km / h (19.538 seconds at a speed Output of the 101.02 C12R). Was not detected maximum power to the dynamometer, but it 's easy to imagine at least 1 hp more than the C12R and greater extension. 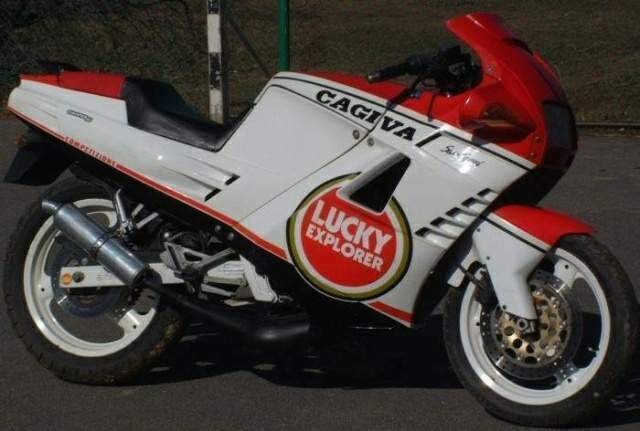 Presented at the Bologna Motor Show December 3, 1988 and marketed since March 1989, Cagiva Freccia C12R is the swan song of the Arrow series and adopt technical solutions that provide the basis for his successor, or the Myth. Although the Arrow begins to feel the weight of years in a market as eclectic as that of 125 road, the few cosmetic changes made to make leaner and C12R C10R fashionable and 7-speed, a true first fruits in the landscape motorcycle world gives the new Arrow that touch of exclusivity which is good mai.La C12R was replaced in 1990 by Mito, although production survive in the economic variant throughout FY 1992. Slight reduction in the size of the already small spoiler in this Plexiglas on top of the windshield and now it is more pleasing to the eye. New front fender smaller and more traditional hours. Definitely the element that most characterizes C12R than its progenitor. New wheels Brembo three spokes. Instrumentation similar to Arrow C10R, but with different graphics now more clear and readable. Now when the gearbox 'in neutral, as well as its light, lights also indicates that the oil reserve to confirm the effectiveness of the bulb. A feature that will resume later also by Myth. Despite a few changes, the C12R has a less heavy and decidedly more modern than the C10R. 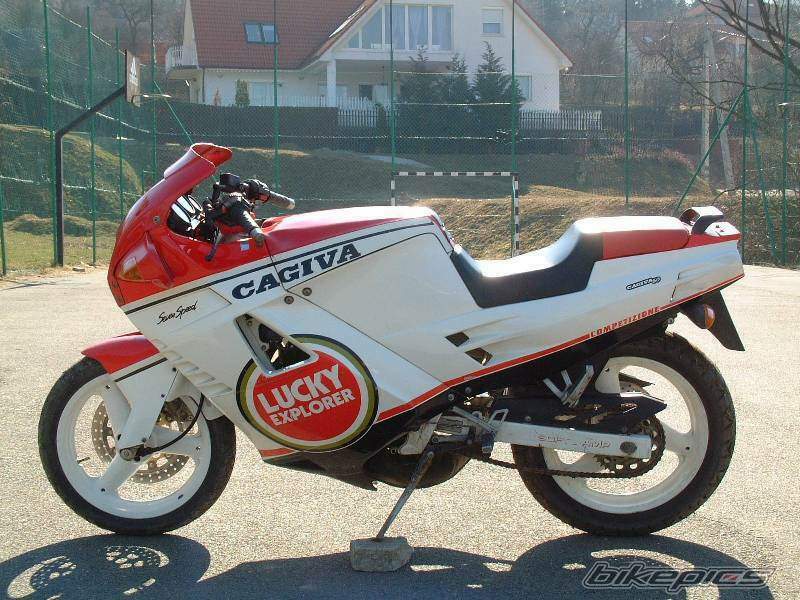 However, part of the cosmetic changes were introduced with the C12R are not exactly new: Cagiva anticipated because the new livery red / white and the new three-spoke wheel on the special edition Anniversary C10R. The chassis and suspension do not differ significantly from the C10R. Are rather new floating front disc Brembo 298mm to 260mm instead of fixed mounted on C9 C10R Brembo wheels and new beautiful three spokes that take A39 Michelin tires and have now the following sizes: 100/80x16 (identical to previous arrow) to 'front and 130/70-17 rear (110/80x17 previous arrow) at the rear. 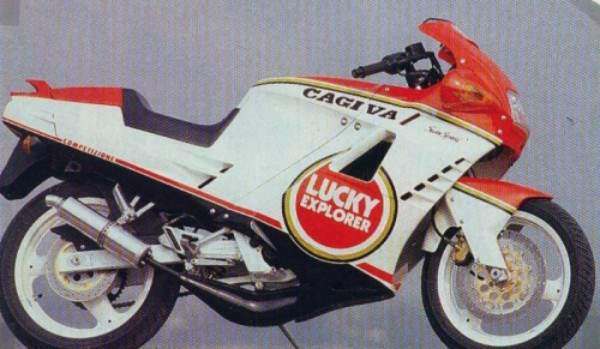 All changes Cagiva had also adopted the special series C10 Anniversary. Amended in the new drum decanting (code 60433 cylinder) and the exhaust system and calibration Dell'Orto PHBH 28RD granted. New electronically controlled exhaust valve instead of the mechanically actuated. The valve and 'hours controlled electronically via a control unit and an actuator that analyze the impulses on. The electronic system ensures greater precision of the point of opening and closing the valve. The guillotine type valve, in aluminum, begins to open to 7250giri to complete his trip in 7500. To avoid blockages and deposits at every start-up, the servo motor forces the valve to a complete opening-closing movement. A system very similar to that adopted on the Honda NSR-F on the issue and adopted by CAGIVA C10R Anniversary limited. New shift at seven gears instead of six. The guard, however, remain the same and additional space for the relationship is obtained by decreasing the excursion of the grafts between the gears. The pedal travel and 'now more limited, although research is now the crowds standing difficult. Defect that also characterize all the Cagiva Mito. The data collected from the Motorcycling in May 1989 confirmed the goodness of the amendments made by technicians Cagiva: The C12R detects a maximum output of 29.68 hp at the wheel 10250giri (27.72 hp at the 10250giri C10R) and a maximum speed of 163 km / h (162.4 km / h C10R). With regard to evidence of recovery in the 400 meters from 50km / h, the calibration of the sportiest C12R shows a time of 19.538 seconds at an output rate of 101.02, a much higher performance than the result of 20.702 seconds at a speed of output of 89.100 km / h obtained from C10R, confirming the better delivery of the motor.